We focus on providing our customers cutting-edge ELISA and Antibody Array technologies for the discovery of disease-related protein biomarkers and key factors, the identification of new drug targets, and the advancement of personalized medicine. 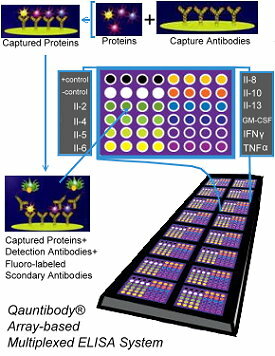 Our Solutions range from traditional ELISA Kits to array-based multiplex ELISA system for simultaneous quantitative measurement of multiple cytokines, growth factors, proteases, soluble receptors, and other proteins in a wide variety of sample types. We also have all required ancillary reagents like Buffers and Diluents. Check out our Power Point of ELISA Methods and Protocols-This teaching guide covers the three major types of ELISA: indirect, competitive, and sandwich. It integrates theory with practice, to help you understand what you are doing, and help you to do it! Courtesy of our friends at Novus Biologicals.